Although I’ve visited Glasgow many times, I rarely venture east of the city centre, normally spending my time in the centre itself, in the West End and, starting last year, the south side. 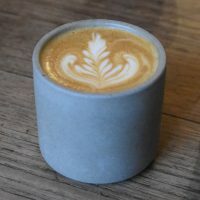 I’d heard about the appropriately-named East Coffee Company, which opened in January 2018, on my visit for that year’s Glasgow Coffee Festival, but with my bad back, I’d not been able to get out there. However, on my return to the city in December, I made it a priority to head over to East for coffee and some lunch. It’s a lovely little place, occupying a front and back room in a row of shops, with tenements above, a very typical set-up for Glasgow. Despite the small size, there’s plenty on offer, including a seasonal single-origin espresso from local roasters, The Good Coffee Cartel (a Colombian during my visit) with decaf from Dear Green Coffee. If that doesn’t appeal, there’s a daily batch-brew, featuring roasters from around the country. While I was there, it was the turn of Sacred Grounds from Arbroath, with a Black Honey processed El Salvador. East also offers a concise all-day breakfast/lunch menu, the food cooked in an open kitchen behind the counter.